This small village is situated on the most easterly point of Ballyvaughan Bay in its own once oyster rich Pouldoody Bay. South at Turlough, the Burren Educational Centre offers hostel – style accommodation,dining and recreational areas, showers and a drying room. The Centre offers a wide variety of adventure and outdoor activities which include caving, canoeing, sailing, orienteering, rock climbing and hill walking. 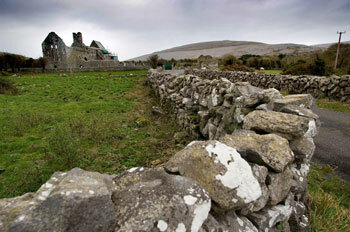 Environmental courses exploring the geology, history and ecology of the Burren are also available. The Cistercian Abbey of Corcomroe is located 1.5km from Bellharbour. The chancel area(around the alter) has some of the finest stone carvings in Ireland. Bellharbour is the more modern name for Bealaclugga, or Béal an Chloga in Irish. 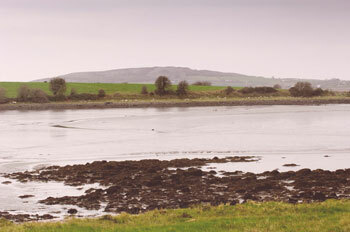 The almost landlocked bay on which the town is situated is called Poulnachogh Bay. To the north, on Finvarra Head, is Parkmore Fort, with two concentric ramparts and a souterrain in the centre. There is also an excellent walk that begins behind St Patrick’s church and goes north along Abbey Hill. If you walk 1km down the Ballyvaughan road, look out for a large green farm shed on the right. Follow the path down to the shore to see seals and hundreds of birds. 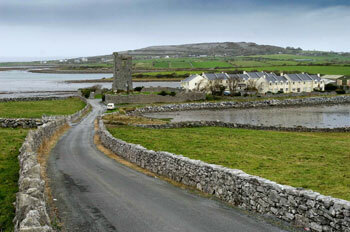 Just inland from Bellharbour is Corcomroe Abbey and the road which takes you through the Burren. 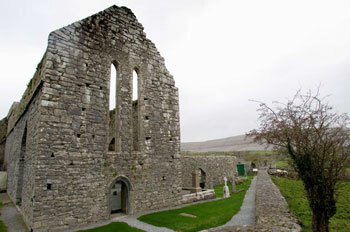 The Abbey is a former Cistercian abbey 1km inland from Bellharbour. It lies in its own small valley, surrounded by low hills. Founded in 1194 by Donal Mór O’Brien, his grandson, Conor O’Brien, king of Thomond, is buried in the north wall. Turn inland at Bellharbour, left at the y-junction and up to a clump of trees on the right. A dirt track will bring you east up a blind valley to the Oughtmama Valley churches. St Colman MacDuagh, who also built churches on the Aran Islands, founded the monastery here in the 6th century. Another three churches were built here in the 12 century. Walk up Turlough Hill behind the chapels and the views are magnificent. You’ll also find the remains of an Iron Age hill fort. Bellharbour is home to the famous concertina player and composer Chris Droney. Discover the Burren through adventure - Rock climbing, Caving, Sea Kayaking and Hill Walking. Spend time with us to truly discover the Burren on our specialised adventures. Our expert tutors and guides bring you to its special places, off the beaten track. We will help develop your understanding of the nature of the Burren – of its landscape, cultural history and unique flora. Our activities offer the opportunity to journey in, explore and experience the Burren – to really discover the Burren through Adventure. We aim to provide vivid, memorable and high quality experiences! Ireland’s First Stoneground Bean to Bar chocolate makers and chocolatier! The boutique chocolate factory, shop and café is located at the foothills of the Burren mountains. Here you can see the art of making pralines in a traditional way and taste the most delicious chocolate pairings such as the Burren juniper berries or violet petals. All chocolates are produced in small batches with only natural ingredients – no artificial pastes, flavours or colours.